In 2008, electricity consumption decreased for the first time. This was due to reductions in the industrial sector, as individual consumers stopped their operation and due to the economic crisis. A substantial increase was noted in wider use (households and other use). Electricity consumption is the electricity consumption of the final energy demand sectors. This indicator does not include own use by power plants and distribution losses. It includes electricity consumption in manufacturing and construction, transport, households and other use. Trends of electricity consumption influence its production. This connection is not formed only on the state level, as the liberalisation of the electricity market ideally means that requirements for electricity can be met from any power plant across Europe. It still holds true though, especially due to limitations in electricity transmissions, that a greater requirement for electricity in Slovenia influences higher production in Slovenia. It is for this reason that information on trends of electricity consumption is a good indicator of environmental impacts caused by the production of electricity. - a 33.6 % share of renewable energy sources in electricity production by 2010. Electricity consumption on its own does not cause environmental pressures. Strong environmental pressure is however caused by electricity production, whereby the level of these pressures depends on the method of production and the fuels used. The efficiency of production depends also on the fuel used for electricity generation and the age of the device. New thermal power plants with gas turbines that operate in a combined cycle for example have a 60 % utilisation efficiency while new coal-fired thermal power plants between 40 % and 50 % (see EN13 – Efficiency of Electricity Production). The efficiency of electricity production is additionally reduced by own use of electricity in production and transmission and distribution losses. Boilers for domestic hot water or water used for heating have a utilisation efficiency of over 90 %. This is why the switch from other end-use energy types towards electricity increases environmental pressures. In 2008, electricity consumption amounted to 12,726 GWh, which is 4 % less than the year before. 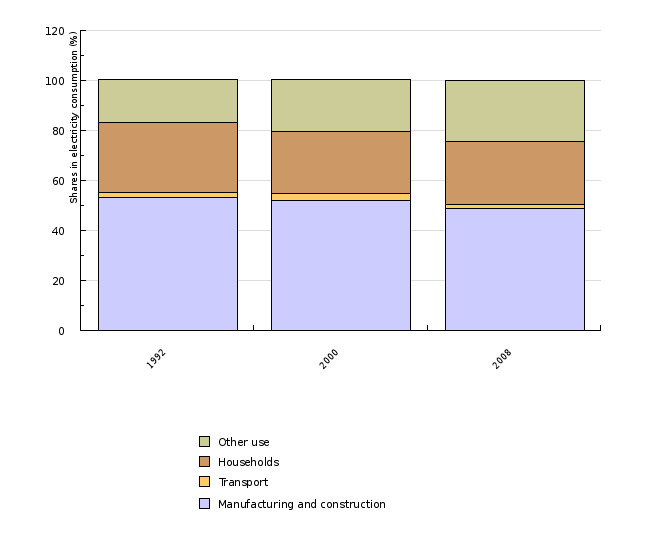 The largest share pertains to manufacturing and construction (49 %), households (25 %) and other use (24 %). 2 % of total electricity consumption pertains to transport (for the operation of trains and ski lifts or cable cars). In 2008, electricity contributed slightly less than 21 % to final energy consumption, which is an almost identical percentage to that in the year 2000. In 2008, total electricity consumption was 46 % higher than in 1992 and 21 % higher than in the year 2000. In 2007, the lowest annual growth since 1996 was recorded (0.7 %) and the reduction in 2008 was the first throughout the entire observed period. 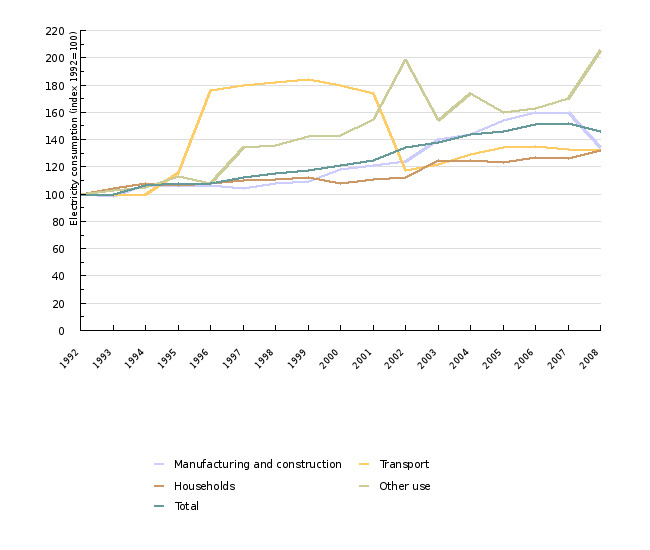 As regards electricity consumption by sector in the 1992-2008 period, the largest growth was noted in other use (105 %) followed by manufacturing and construction (34 %), transport (33 %) and households (32 %). 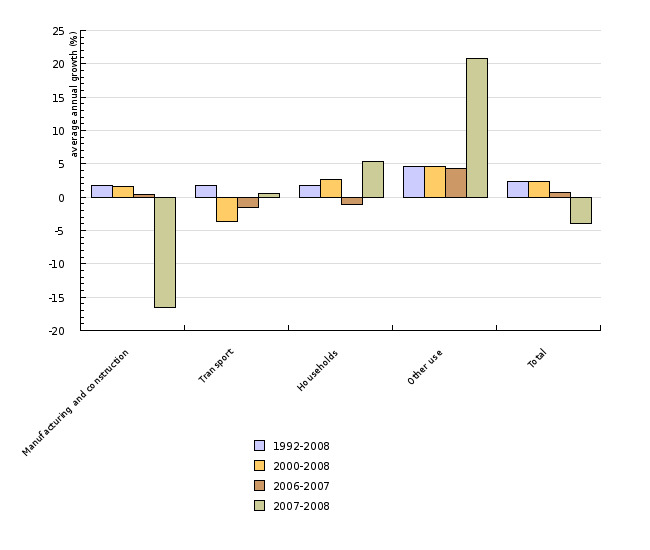 On the one hand, electricity consumption in the other use sector grew due to changes in the method of data collection, as this item is calculated as the difference between total electricity consumption in Slovenia (excluding own use of power plants and losses) and consumption in manufacturing and construction, transport and household sectors and changes in the tariff group (Merše, 2005). On the other hand, this growth is also due to the growth of the sector itself (in 2008, real added value was 94 % higher than in 1992). In 2008, consumption increased by slightly less than 21 %. A similar increase was recorded also in 2002, whereby in 2003, consumption decreased by 23 %. In the 1992-2008 period, electricity consumption grew at a rate of 1.8 % and in the last seven years at 1.6 % annually. In the sixteen-year period, added value in manufacturing grew at an average annual rate of 4.4 % and in the last eight years at a rate of 5.0 %. After the year 2000, consumption substantially increased in 2003 due to the operation of the new electrolysis facility in the production of primary aluminium and in 2005 due to increased consumption in the manufacture of basic metals and fabricated metal products and in construction. The minimal growth in 2007 is the result of a reduction in electricity consumption in the manufacture of basic metals and fabricated metal products sector (the gradual closing of Electrolysis B that concluded in December of the same year) and in construction. Electricity consumption substantially decreased also in food and beverages production. On the other hand however, electricity consumption increased in the manufacture of machinery, equipment and transport equipment (Revoz), in the chemical industry and in the manufacture of non-metallic mineral products (cement, lime, etc.). The reduction in 2008 was predominantly due to lower consumption in the manufacture of basic metals and fabricated metal products due to the Electrolysis B facility ceasing operation and the onset of the economic crisis (ironworks). An important effect on the consumption was also the reduction in the production of chemicals and chemical products (the ceased operation of TDR Ruše) and in the manufacture of machinery and equipment. A smaller reduction was noted also in other branches with the exception of the manufacture of electrical and optical equipment and manufacture of transport equipment, where consumption increased. Despite a substantial reduction, the manufacture of basic metals and fabricated metal products, which includes the manufacture of aluminium and steel, still holds the largest share in electricity consumption in the manufacturing sector, as this branch consumed slightly more than 39 % of all electricity consumed by industry. In 2008, this branch held 19 % of added value. In 2008, two other industries held a share of electricity consumption over 10 %. These are the manufacture of pulp, paper and paper products (DE) and the manufacture of chemicals, chemical products and man-made fibres (DG). Their share in added value accounts for 8 % and 14 % respectively. The reduction in electricity consumption by industry is therefore due to the closing of plants and the economic crisis that had already had a substantial effect on the operation of different companies by December of that year. In 2007, the high price of electricity, which dropped in 2008 due to lower demand, also had an important effect on consumption. In 2008, electricity consumption by households increased by 5.3 %. After 2003, consumption constantly changed: a reduction in 2005, growth in 2006, another reduction in 2007 and again an increase in 2008. 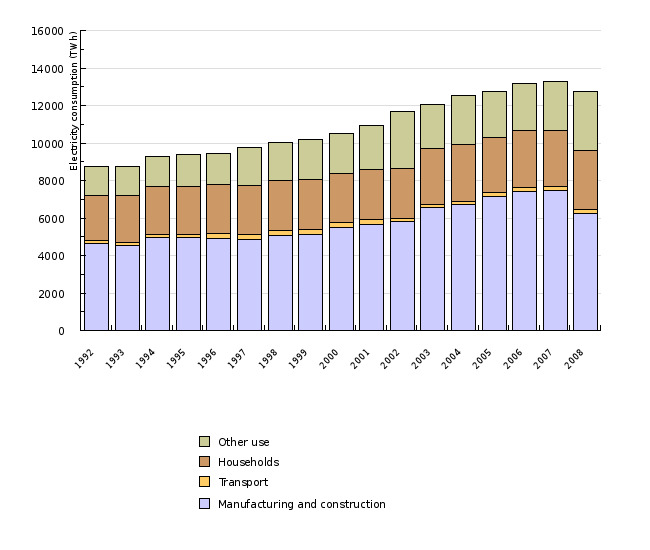 Furthermore, consumption substantially increased in 2003, which is probably related to data collection, as in the same year, consumption in the other use sector substantially decreased (the same applies also to manufacturing and construction). The growth in electricity consumption by households is influenced by the rising standard of living and the resulting furnishing of households with major and small household appliances, large LCD and plasma screens, air-conditioners, lighting, etc., the growth in the number of households, the growing computerisation of households (a higher number of broadband internet access connections, growth in the number of households owning and using computers) and by the increased use of other electronic devices (mobile phones, wireless phones, audio and video devices, etc.) In the future, electricity consumption will be strongly influenced by the implementation of digital television, as watching programmes on an old (analogue) device will require the use of an additional device. On the other hand, reductions in electricity consumption are influenced by substantial improvements made to the energy efficiency of major household appliances, energy labelling of appliances, which has a positive impact on the structure of these appliances, since the price is no longer the only criterion when buying a new appliance and by information and awareness campaigns. According to research conducted by the Jožef Stefan Institute for the year 2005, the structure of electricity consumption by households is as follows: 25 % for heating domestic water, 21 % for cooling (freezers and refrigerators), 14 % for washing and drying, 10 % for lighting, 9 % for cooking, 6 % for heating and 15 % for other uses (where television sets prevail with 6 %). 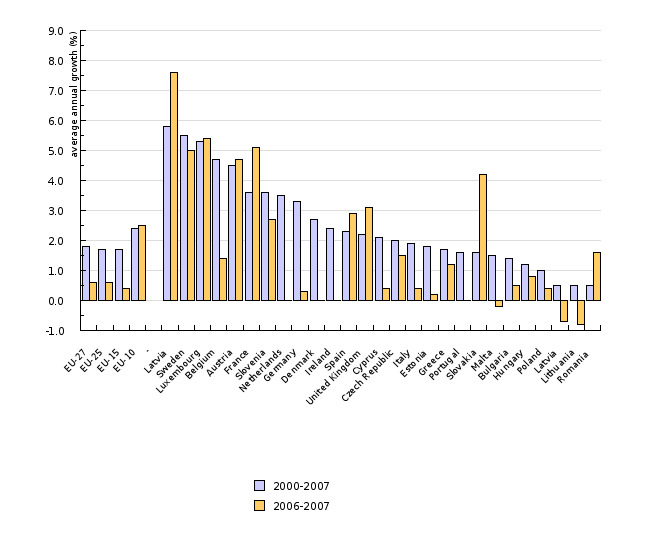 In the 2000-2007 period, electricity consumption increased in all of the EU-27 countries, with different trends being evident in 2007. Consumption decreased in five Member States, the most being in the United Kingdom and Denmark. In seven Member States, including Slovenia, growth was below 1 %. In three countries, growth exceeded 5 %, with the highest growth being noted in Latvia. As regards growth in the 2000-2007 period, Slovenia is part of the top half of countries together with several new Member States, Ireland and Portugal. As regards growth in 2007, we are in the bottom third. As regards the EU-25 average, growth in Slovenia was substantially higher in the seven-year period, while it was 50 % below average in 2007. Electricity consumption per capita greatly varies between countries, as it is influenced by several factors – the structure of manufacturing industries, the structure of electricity consumption by households (for heating, for domestic hot water, etc. ), the standard of living, etc. Slovenia is among the top third with the main reason being the low level of energy consumption in wider use (the third lowest share in the EU-27), as electricity consumption by the industrial sector is much more intense. • Public and service sectors: green public procurement, excise duty on electricity, etc. • Households: financial incentives for efficient electricity consumption including incentives for purchasing energy efficient household appliances (refrigerators, freezers, washing machines and dishwashers), co-financing and promotion of purchasing energy saving light bulbs and implementing intelligent meters, fast measuring and consulting in households and energy labelling of household appliances and other devices. • The tertiary sector: co-financing or purchase of 1,000,000 energy saving light bulbs, installing lighting control for 700 systems of public lighting and 38,000 energy saving light bulbs, refurbishment of 1000 air-conditioning and 2000 ventilation systems and conducting 1500 audits and consultations. • Industry: financial incentives for measures aimed at facilitating efficient electricity consumption, including investments in energy efficient electric motors, pumps and fans, frequency regulation of rotation speeds, energy efficient compressed air systems and energy-saving lighting. • Multi-sectoral instruments: Demand Side Management (DMS) programmes that will be implemented by electricity suppliers, requirements for minimum energy efficiency of products that currently include refrigerators, freezers and ballasts. In the future, the range of these products will be substantially expanded. The implementation of these measures foresees total electricity savings of 516 GWh through the entire period of the action plan. The required financial means amount to 75 million euros. Objectives summarised by: Resolucija o Nacionalnem energetskem programu (Resolution on the National Energy Programme, Official Gazette of the Republic of Slovenia, No. 57/04) and Directive 2006/32/EC on Energy End-Use Efficiency and Energy Services. Source database or source: For the 1996-2008 period, data provided by the Statistical office of the Republic of Slovenia were used as obtained using the SI-STAT data portal (> Environment and natural resources > Energy > Electricity > Balance of production and consumption of electricity (GWh), Slovenia, annual. For the 1992-1995 period, data as submitted to EUROSTAT in the Joint Annual Questionnaire were used. The number of inhabitants was obtained from EUROSTAT’s website. Data administrator: The Statistical Office of the Republic of Slovenia – Jože Zalar and EUROSTAT. Methodology and frequency of data collection: Data on electricity consumption are prepared (collected) on an annual basis and published on the website of the Statistical Office of the Republic of Slovenia and in printed form. For the indicator, data on electricity consumption by manufacturing and construction, transport, households and other use sectors were used. EUROSTAT marks these sectors as 101800 (Industry), 101900 (Transport) and 102000 (Other Sectors) Data have further been sent to Eurostat. The EUROSTAT/IEA methodology has been used in preparing data. Two different sources of information were used – before 1996, the source of information was the filled in EUROSTAT questionnaire and since 1996, the official statistics of the Statistical Office of the Republic of Slovenia. Data processing methodology: Average annual rate of growth in electricity consumption is calculated using [(last year/base year) ^ (1/number of years) –1] x 100. 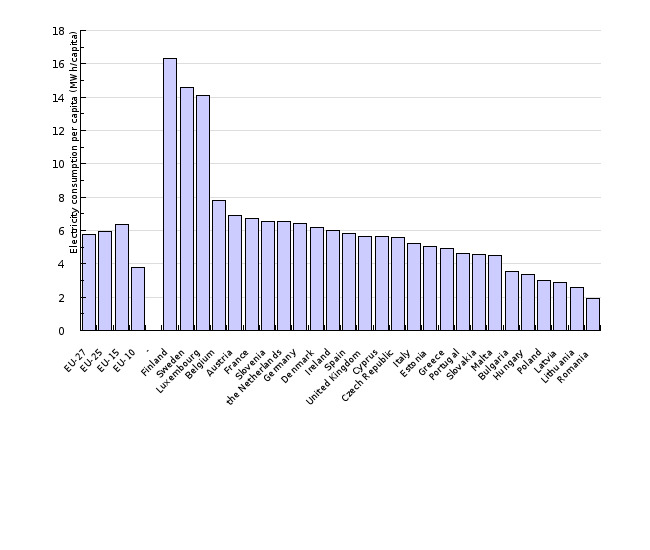 Electricity consumption per capita is calculated by dividing electricity consumption by the population of each country. The population as of 1 January was used. The share of individual sectors is calculated as the ratio of electricity consumption by an individual sector and total electricity consumption. - Advantages and disadvantages of the indicator: Officially reported data that are calculated using internationally confirmed methods have been used to calculate the indicator. - Directive 2006/32/EC of the European Parliament and of the Council of 5 April 2006 on Energy End-Use Efficiency and Energy Services and Repealing Council Directive 93/76/EEC. - EEA, 2008. EN18 Electricity Consumption. - Merše, 2005. Načrtovanje vključevanja ukrepov usmerjanja porabe električne energije v Sloveniji, kot element za prognozo porabe električne energije (Integrated Resource Planning – IRP), Final Report. - Ministry of the Environment and Spatial Planning, 2008. Nacionalni akcijski načrt za energetsko učinkovitost za obdobje 2008-2016 (National Energy Efficiency Action Plan for the 2008-2016 period).